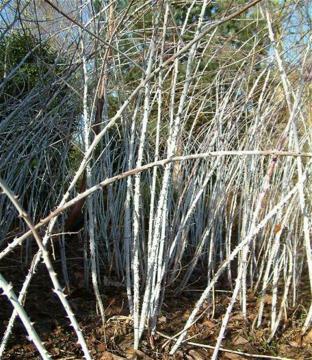 Upright and arching very thorny stems are covered in a whitish bloom, giving a distinctive effect in winter. The fern like pinnate leaves also have a bloom on the undersides. Purplish-pink flowers followed by bloomy-black fruits. Any reasonable, well drained soil in sun or shade. Not fussy about soil or position. Very vigorous once established and needs a lot of space. All stems should be cut to near ground level in the spring to encourage young growth which will provide the best show for the following winter. From seed, by layering or separating rooted suckers. Interesting stems in winter. Plant against a dark background. Can also be used to create impenetrable boundary thickets.